Drinking and eating Keto at Dunkin Donuts can be a daunting task and I totally understand why. The nutritional information provided on their site is a bit all over the place, so it’s no wonder that people may avoid it when choosing low carb options. While it may be a little tough to navigate, you can actually find some choices that will be satisfying and won’t blow your progress. You probably won’t be enjoying any actual doughnuts, unfortunately. Essentially, your options will be beverages and breakfast sandwiches with no bun (please). Fear not, these things are still really delicious! Craving something different for lunch? Check out my running list of dining out guides for Keto — there’s something for everyone! Dunkin Donuts is limited on sweeteners. You can typically get Splenda or sugar. Splenda doesn’t mix too well in cold drinks, so I usually end up bringing my own stevia or monkfruit drops. The creamer options are… less than ideal. I love that almond milk is an option, but it’s sweetened. Also, while the cream may be the best option, it’s mixed with milk (like half-and-half), boosting the carbs a bit. If you’re avoiding dairy and still want a creamy coffee with a lower carb count, I highly recommend using coconut milk or Nutpods. They’re not super portable, but you can always pour a little into a container and bring it with you! For a small, add 10 calories and 2 carbs. For a medium, add 20 claories and 5g carbs. For a large, add 30 calories, 1g fat and 6g carbs. For a small, add 60 calories, 6g fat, 1g carbs and 1g protein. For a medium, add 85 calories, 9g fat, 2g carbs and 2g protein. For a large, add 110 calories, 11g fat, 3g carbs and 3g protein. For a small, add 10 calories, 1g carbs and 2g protein. For a medium, add 20 calories, 3g carbs and 2g protein. For a small, add 10 calories, 1g fat, 1g carbs and 2g protein. For a medium, add 20 calories, 1.5g fat, 3g carbs and 2g protein. For a large, add 30 calories, 2g fat, 4g carbs and 3g protein. One thing that I’ve noticed that is unique to Dunkin Donuts (and fortunately, is pretty Keto-friendly) is the assortment of flavor shots. Best of all, they’re unsweetened and sugar-free! Word of caution, DO NOT confuse the flavor shots with the flavor swirls. The flavor swirls are loaded with sugar! Flavor shots can be added to any beverage, and you can even order multiple! Unfortunately, the nutrition information for the Dunkin Donuts flavor shots is unknown, although I can’t imagine that they add much from a macronutrient standpoint. The ingredients are as follows: Water, Propylene Glycol, Glycerine, Natural and Artificial Flavors, Caramel Color. By default, the coffee comes with some carbs. Not completely sure why, but that is according to their website. Pretty standard here. You’ll want to order iced or hot tea, unsweetened. You can add Splenda or your own sweetener, if you like. Also avoid the fruited teas, as well. No nutritional information listed, however the website states: All varieties of our tea and herbal infusion have no nutritional significance. Large Bold Breakfast Black Tea has 180+mg of caffeine**. You’ll notice that some of the nutrition info listed below is the same when you remove the bread portion. Play this to your strengths and see if they are running any promotions on the sandwiches. This can generally save you some cash and possibly land you some extra food! When it comes to nutritional information for the wrap portion of the Wake-Up Wraps is not available on the website, so I can’t provide specific numbers. If you are more lax in your Keto lifestyle and not necessarily tracking everything, getting these without the tortilla would be fine as well! After all, they’re still only about 15g carbs *with* the wrap. I’d say that they’re probably 3-4g carbs, to be on the safe side. You can save some carbs by bringing your own creamer or foregoing it all together. I’ve totally been that person to bring my own heavy whipping cream before — I have no shame! You’ll have to pass on the vanilla chai — it’s a latte full of sugar. Avoid confusing it with the regular, unsweetened hot teas. As mentioned earlier, if you’re getting a breakfast sandwich without the bread, see if they are running any current promotions. 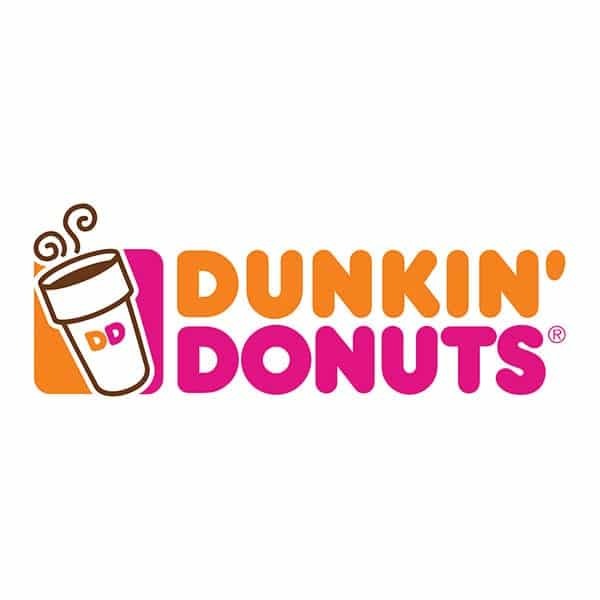 Dunkin’ Donuts often has a 2 for 1 special, which can net you more food at a cheaper price. If you’re going to remove the bread anyways, it really doesn’t matter if the special is on croissants, bagels or muffins! 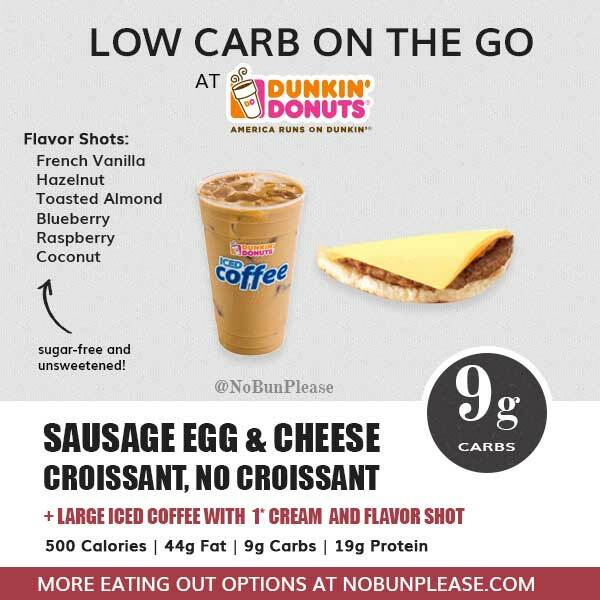 All nutrition information for this post has been taken from the Dunkin’ Donuts website. You can also view a PDF of the menu items (unfortunately, they all include the bread) if you’re interested. Wish they’d bring back the Flatbread Veggie Sandwich, and creat a low carb Boston Kreme donut!! Oh my gosh, totally remember those! They used to also have a chipotle turkey sandwich. I’m not big on turkey, but that sauce was delicious! Love that, so accommodating! I need to find your Dunkin! Haha. Since it that time of the season i lv pumpkin, but im on Keto…here’s what i get extra lg pumpkin decaf with cream..IS THIS BAD? And i use carb manager app, do u know how i would put that in?